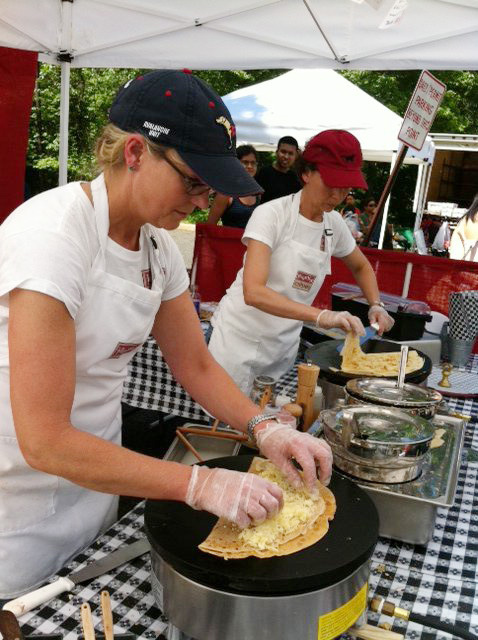 ALL OUR CRêPES ARE COOKED-TO-ORDER AND SERVED HOT OFF THE GRIDDLE. WE OFFER A WIDE SELECTION OF SWEET & SAVORY CREATIONS TO CUSTOM DESIGN YOUR EVENT. 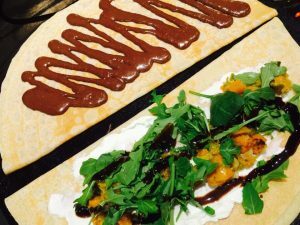 our crêpes are filled with seasonal produce, meats & cheeses from regional farms and food Artisans. We offer an ever changing menu that highlights the very best local ingredients at their peak of freshness, complemented by our own micro-batch jams, pickles and condiments. Our batter is made from scratch using local free-range eggs and artisan flours. in addition to the “per person” price, There is a minimum 2 hr cooking fee ($50 per hr) for service inside or outdoors. Our staff will arrive at least 30 minutes prior to cooking time for set-up. We provide compostable crêpe cones & napkins in our pricing and can supply plates and cutlery upon request.